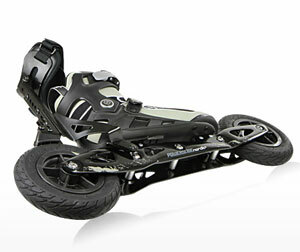 Powerslide has been a successful manufacturer of inline skates for many years. The company is a leading producer of fitness skates as well as speed skates. There has been strong dedication to nordic and cross-skating sport in the past few years. 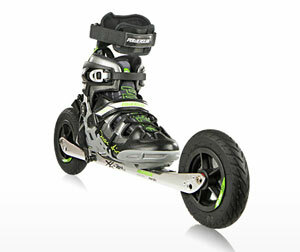 Powerslide Nordic Skates were named top product in 2010 which is an achievement based on Powerslide's wide development experience. Most Powerslide Nordic Skates are delivered with optimized shoes. Powerslide boots meet the requirements of Nordic cross-skating sport, guaranteeing a solid foothold and perfect ventilation. The shoe is built with fast installationand hardening, providing direct power transmission to ensure high safety. Other cross skates usually require strapped on shoes. While this appears to be very convenient at first sight, it proves to make the correct choice of shoe rather difficult. People who buy strap-on skates are likely to get new shoes with a better fit in the long run. Some people buy cross-country skiing shoes as these are suitable for skating sports. It doesn’t matter which type of shoe is eventually used, because it is hardly possible to obtain full direct power transmission of Powerslide Nordic Skates. Powerslide Nordic Skates are equipped with highly efficient brakes. These can be adjusted individually. Powerslide Nordic Skates contain tyres of a better quality than those of other cross-skates, guaranteeing less tyre damage and longer performance.